Outerwear from old Mountain Dew bottles? Sounds crazy, but it’s true. Burton teamed up with fellow alpine enthusiasts Mountain Dew to recycle plastic bottles into functional, stylish outerwear. Burton's Green Mountain Project transforms plastic bottles into pellets that are spun into thread in order to create fabric. Burton hit up outerwear designer Colin Alger to see what working with Mountain Dew is like and what his favorite pieces are. What has been the benefit of working with Mountain Dew’s fabric vs previous GMP lines? Working with Mtn. 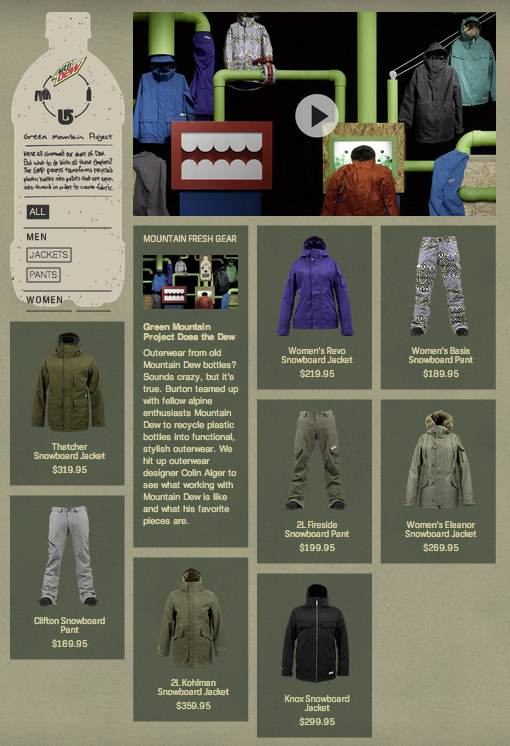 Dew has allowed Burton to expand its own footprint of rPET within the line for this season and moving into next season. With their help and collaboration we can grow and move in the right direction. Are there new avenues offered for recycled and eco-friendly materials that we are now looking into? Yes, we are working with new fabric mills like Bionic Yarn® as well as finding fabrics made of natural fiber blends. How does a line like this make you feel personally? Overall, it’s a focused step in the right direction, which I like. I’m stoked that every year we are able to expand the offering more with the resources that are opening up within our supply chain. Being able to take advantage of this to build product I feel good about and from a material and process sense is a great feeling for sure. What’s your favorite GMP piece? For a kit I’d have to say I’m backing the Kohlman Jacket and Fireside Pants – both are a Mid fit, great fabrics, and look great together. If I just had to pick a jacket, I like the Kohlman Jacket, the Mid Trench fit is proper.